It’s been a dry summer for going to shows for me. Life and a lot of weekends away backpacking have got in the way. So I was happy to get to go see Andrew Bird last Sunday at the Greek Theater even if I’m not that well-versed in his music. We made it in time to see opener Sharon Van Etten. I’d heard her newest album, Tramp, and enjoyed it enough to want and check her out live. She has a nice voice with some range that she showcased on both delicate ballads and a few rockers like Serpents from her new album, a very good song that was apparently, according to her stage banter, the first song she wrote on electric guitar. It was a fast 30 minute set, but she didn’t feel rushed enough to skip interaction with the crowd between almost each song. It was endearing, nervous, and possibly a little drunk banter that the crowd seemed to enjoy. 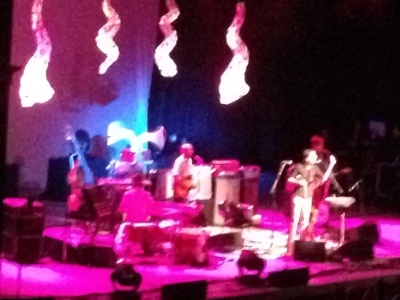 Next up was Andrew Bird. Above is an admittedly crappy cell phone pic of the stage. Four helix shaped cones that at times looked like either horns or bones depending on the lighting were above the stage. The other oddity was a box with two protruding speakers that at various points spun, creating a whirling vortex of sound. Apparently it’s called a Janus horn. My bottom line after seeing him was I would definitely recommend seeing him if he’s in your town. He and his band move over different musical landscapes over the course of a show: bluegrass, improv jazz, classical, rock, lyrical flourishes. And whistling. The man can whistle (Walter’s whistling scene in the latest Muppets movie, yeah that’s him) and as a horrible whistler I was duly impressed. And it all was delivered with pizazz. Bird is a physical performer, with a lot of arms waving and evocative gestures, as if these movements helped to get the music out to the audience. Even when he forgot to set one of his effects pedals, he made a joke and started over without missing a beat. And his guitarist is simply Lonesome Jim. All of it left me wanting to listen to more of his stuff. Here’s a setlist, Nervous Tic, MX Missiles and Measuring Cups were some of my favorites.